Pro Art Makeup Academy is founded by Aarti Gutta, an entrepreneur, educationist, author and beauty & hair dressing professional whose passion lies in the art of transformation. Her visual philosophy revolves around reimagining looks that seamlessly fit into her clients lifestyles. Aarti has an impressive string of educational degrees neatly tucked into her makeup kit including Training at Kimare International School, Singapore; Cosmoprof Make-up in Bridal Artistry & Special Effects, Singapore; Advanced Ladies Sculpting & Creative Cuts, Pivot Point; Toni & Guys Classic Cutting, Singapore; Diploma from City & Guilds, UK and Diploma from Saks, London. Her endeavor to constantly discover & evolve revolutionary rituals in the beauty & makeup industry, coupled with her global exposure and leadership skills earned her a place as the President of the All India Hair Dressing Association. She has shared her expertise as Mentor Council, DGET India and played a key role in developing the quality pack and National occupational standards for beauty therapy, hairdressing and make up level 3, 4, 5 and 6 in her capacity as a member of the governing council of the Beauty and Wellness sector. 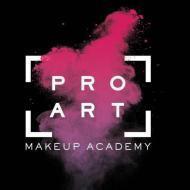 Pro Art Makeup Academy conducts classes in Beauty and Style and Makeup. It is located in Alwarpet, Chennai. It takes Regular Classes- at the Institute.